A mobile vehicle with V2G disrupts the market and offers buildings new options with an option to use one or more V2G enabled electric vehicles as personal power grids. Imagine a building in the middle of a blackout and a car driving up with a V2G battery ready to charge the whole building within hours? That is a disruption reaching smart buildings very soon. EVs helping utilities with demand response is now creating such a disruption in smart buildings. V2G or Vehicle to Grid technology uses bi-directional batteries which enable EVs to store charge and return power to the electric grid. Italian utility company Enel tested V2G with Nissan Leaf electric car owners. Mitsubishi tested Vehicle to Grid with TenneT the Dutch utility company in the Netherlands and with Japanese Utility TEPCO using Nuvve's Grid Integrated Vehicle platform (GIVe). Are you wondering how EVs helping utilities with demand response is relevant to smart buildings? 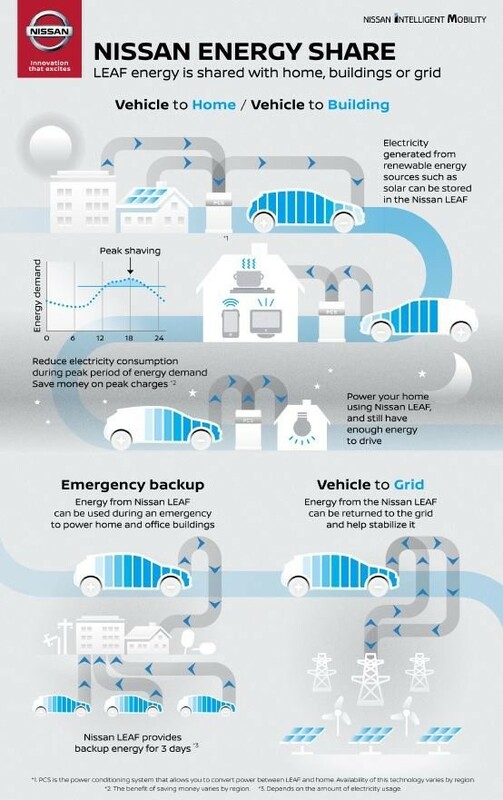 In Nov 2019, Nissan demonstrated along with Femato V2G systems company that its Leaf EV could power its headquarters in Franklin, Tennessee, USA and its design center in San Diego, California. This opens new doors for building facility managers in their emergency management plans. First, V2G battery-powered EVs can bring the charge in a blackout or serve as a backup power source in an emergency. As seen in figure 1 below, the vehicle will store energy from solar panels during the day. During the night, the car will act as a battery storage unit and discharge electricity and power the building. Energy costs are a huge part of the operational cost of building management for an office park of many buildings or apartment complex of buildings. As buildings become smart, an increasing number of appliances in the building are getting connected to the Internet. These increase the demand for power in the buildings. Also, as more users switch to electric vehicles, buildings offer EV charging stations in their parking lots. All these increase the demand for electricity and create uncertainty about peak demand times for charging. Buildings are typically tied to one utility company that has historically established power lines into the building. These utility companies have a monopoly over providing power to the building and in their price offering. Building owners and facility managers should proactively adopt this innovation and build their own personal power grid with V2G vehicles. As Vehicle-to-Grid from EVs becomes cost-effective, we will see companies offering local micro-grid services by investing in a fleet of V2G enabled EVs. An innovative minded building owner can create their own micro-grid service to power their office park or apartment by investing in a fleet of V2G powered EVs. The building’s energy demand will only increase with the increased number of connected devices installed and increased EV charging customers in the building property premises. A micro-grid using EVs will help scale as demand increases by purchasing additional V2G EV vehicles and will help building owners and managers by offering better pricing for energy. Smart Buildings should watch V2G for buildings technology as the cost of bi-directional batteries comes down to become cost-effective. They should embrace the disruption from Vehicle-to-Grid technologies as we get ready for a world with Electric and Autonomous Vehicles.